Pete, do you know how many units? Depending on the height, I would 200-250. I don't have many details at this point but it's bound to be large given the size of the tract. Can you tell if it is going to be like Level and the Edge with the parking structure in the middle and everything else outside of that? You probably haven't seen renderings but do the developers have a track record of doing that? I would expect it to be at least four levels with an incorporated parking structure. Yowzers! Here we go again! Must have been one of the items Lackmeyer has been alluding to in his recent live chats. Wow! And the momentum continues. It's funny, because when I was putting together the summary aerial for the project announced at 10th and Shartel, I couldn't help but notice and wince seeking the lot we are talking about here. It's the great thing about increasing density... It causes everyone to look with increasing scrutiny at everything that is un- or under-developed. All those open spaces become opportunities. Impressive! Amazing that that particular area has now taken off. 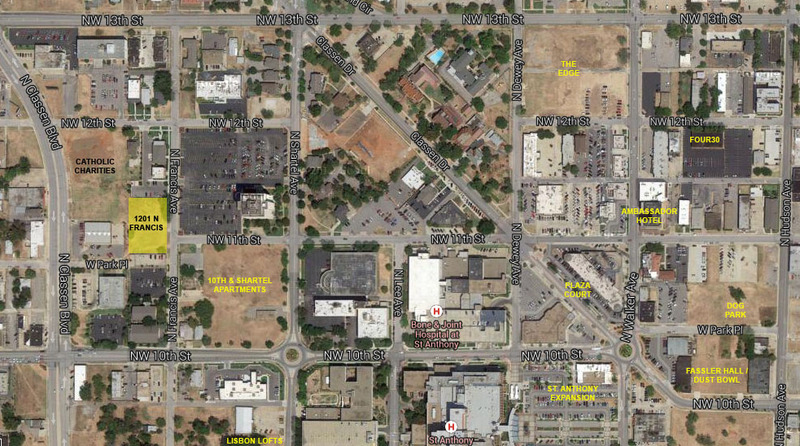 Doesn't this news make the EMSA site the most important lot in (north) Midtown? These two announcements plus the inevitable large Midtown Renaissance announcement make this lot nearly equidistant from the densest developments in Midtown. This is simply unbelievable. What I love about this is that it seems the development is organic. I'm going to start looking at buying a lot on Classen, because this is all going to reach there very soon. People have no idea what OKC is going to be like in five years. It's actually stunning. We're seeing rapid densification in the urban core -- and 90% of it is residential. This only bodes well for the sustainability of the growth we've seen in the various Downtown districts. It's a multiplier effect: more housing begets more housing; more hotels beget more hotels; more retail leads to more retail. The common denominator is more people -- a lot more people. Then, we're going to have a functioning transit system to whisk them around the various Downtown districts, which will literally explode with energy and new retail / service businesses in the next few years. Hopefully this development will follow the trajectory of Gary Brooks' properties: high quality materials and finish along with good design. One thing that occurs to me about all of this residential development is that it is putting more people into the absolute heart of the city, as opposed to, say, Dallas, where most of the residential is in the Uptown area. Next question: where are they going to put the Whole Foods? Completely serious. The streetcar is going to accelerate development like you wouldn't believe. There are still a huge amount of people in OKC who still think of "downtown" as just a few skyscrapers and Bricktown. Maybe the Myriad Gardens and the Arts Festival. They may go to a Thunder game, go to the Bricktown Brewery, or eat at Zio's. Then they go home. When the streetcar opens up, it will be a novelty to a lot of the people who come downtown. They'll ride it just to see where it goes. And for the first time, tens of thousands of people will be exposed to Midtown and everything that is going on up there. The more of these large apartment complexes that we get, the closer together everything will become. We'll get more places to eat, more things to do, more unique shops, etc. An extra thousand people in Midtown will need a lot more places to eat than just 1492 and Louie's. And when these districts start getting linked together, so that your average visitor can hop around between the different areas easily, the growth will just speed up. …All that to make the point that Midtown needs to focus heavily on the retail portion of mixed-use at this point. It has the businesses, it will have the residences, it has the restaurants. If Midtown can get some late-night entertainment and retail, this will be an incomparable district in OKC. And obviously the expectation is that all four of these residential facilities will have some amount of space for mixed-use. Hopefully a vast majority of that is geared toward retail, but there will undoubtedly be food/drink concepts as well. So happy about this. That parking lot is an assault on all things good and decent and it makes my eyes burn every time I see it. I can now reveal that the developers behind this project are the Midtown Renaissance people. 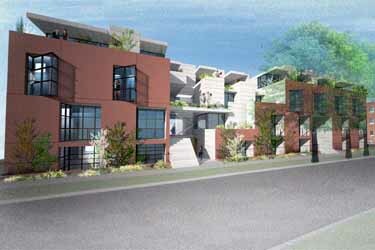 And this is likely to happen before their proposed development at 10th & Harvey. Is this a direct response to Steve's note in today's chat? Seems to me like it is. No, just providing more details as I had promised. Great news! The quality of MR's work has been outstanding. Hopefully their high standards will continue with this ground-up construction. Lisbon Lofts on 9th, the new Brooks/Milhaus development on 10th, and now this on 12th. Shartel is a rocking street all of a sudden. This is like an "instant" community popping up. Eagerly awaiting the details / renderings for this. Shartel is the most under-rated street in the city, IMO. From NW 50th all the way through DT, it has some of the most scenic views, goes through all the nice gentrified neighborhoods, and is a nice hilly street. When I was in high school in the late 70's, I used to drive a delivery van for a local dry cleaners and I had a stop downtown and another about about 45th & N. Western. I would take Shartel all the way up because I loved the drive. I really hope they have the foresight to make this area pedestrian friendly before it gets too auto populated. At least narrow the lanes and add bike lanes on either side from 13th down to 6th street and wider sidewalks.